Licking/Knox Goodwill is excited to provide free formal wear to students in Licking and Knox counties. Priceless Dresses and Dreams launched in early 2014 and has collected a closet of dresses in every size, shape, and color. Our hope is that every student who wants to attend homecoming or prom is given the opportunity to find their special dress and made to feel like princess. 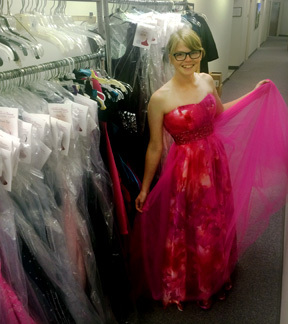 Priceless Dresses and Dreams is open to anyone in need of formal wear for homecoming and prom. Individuals may be asked to show proof need. To make an appointment please contact the Goodwill Administrative Offices at 740-345-9861; day and evening appointments are available. The closet does stock menswear; however, availability is limited. Did you know…? Licking/Knox Goodwill is an Accredited Rehabilitation Facility in the field of Employment Skills Training.